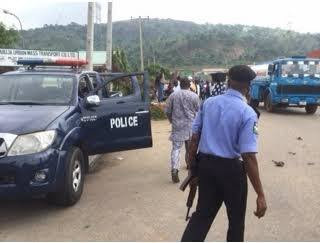 A man was attacked by armed robbers in front of a bank at Ajibade bus stop on Mokola/Sango Road, Ibadan, Oyo State, on Wednesday as he made his way into the bank. A crowd of sympathisers and onlookers gathered around him as he writhed in pain after being shot in both legs by one of the robbers. According to the victim, he was brought to the area by a commercial motorcyclist and soon after he paid the fare, he was accosted by two men who also came on a motorcycle. He said they demanded that he brought out the money on him, with a threat to shoot if he refused. “I thought they were men of the Special Anti-Robbery Squad, so I explained to them that I was not a thief and that I was going to the bank. But one of them brought out a gun and when I delayed in handing over the money, he shot me in both legs. I gave the money to them,” said the victim. The Punch later gathered that N1.7m was snatched from the victim. The commercial motorcyclist who brought him to the area said immediately he dropped him at the bus stop, he heard two gunshots and suspected that his last passenger could be the victim. The motorcyclist said he picked up the robbery victim at Mokola and was suspicious of two men on another motorcycle behind them. "I suspected their riding pattern. The motorcycle they used had a Lagos number plate. They followed us closely and at a point, they wanted to overtake us, but they did not. When I dropped him at the bus stop, they were also there. I did not know that my passenger had money on him. If I had known, I would have alerted him to the suspicious behaviour of the two men on the motorcycle,” he added. A team of policemen later arrived at the scene and took the victim to a hospital in front of the bank.